ned's blog - Call of Juarez: Bound In Blood server. Call of Juarez: Bound In Blood server. Shootout - Deathmatch based on bounty instead of frags. There is a bounty for the head of each player. 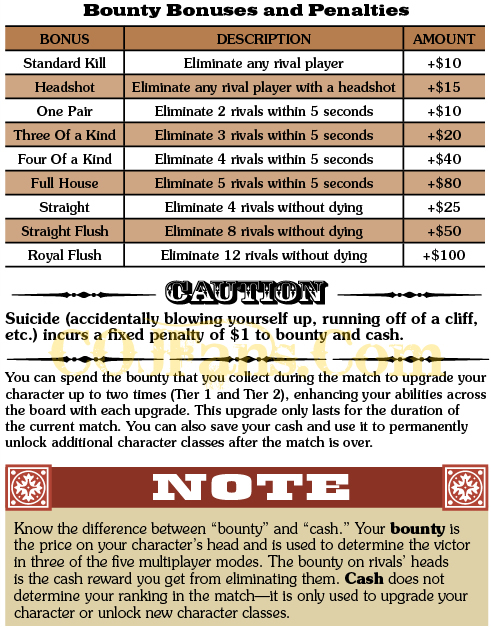 When you kill a player, you earn the amount of cash equal to his or her bounty. Wanted - Only the Wanted can gain points for killing. The other players can score by killing the Wanted. The player that kills the Wanted becomes Wanted himself. Wanted players have their location displayed via the HUD. Manhunt - There are two teams and one Wanted player - the top player in one of the teams. If the Wanted player survives for 60 seconds, the team scores. When the Wanted player is killed, a new Wanted from the opposing team is assigned (the top player in that team). Wild West Legends - One of the teams has several objectives to complete; some can be completed in different ways, some are optional. The opposing team is trying to prevent completion of the objectives within the given time limit. Levels are strongly themed and based on real historical events. Note: All characters are unlocked in a LAN game. [ET] customs night 9 info!